In late August-early September 2016, the north-eastern regions of North Korea suffered from floods caused by typhoon Lion Rock and heavy rains. 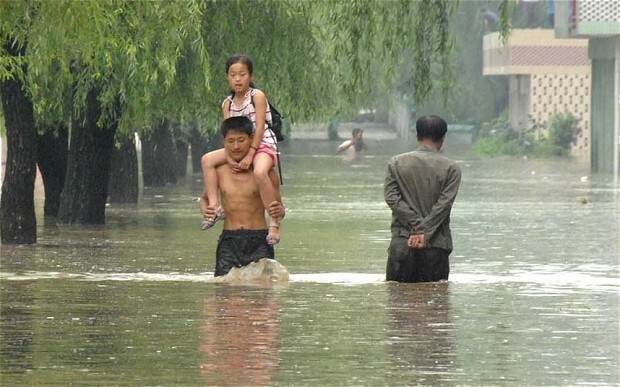 From August 29 to September 2, the level of precipitation in the North Hamgyong Province ranged from 290 to 320 mm, which then caused the Tumen River to burst its banks. This flood is said to be the worst in the territory of the DPRK in the last 70 years. Human victims? The Associated Press reported that 133 people were killed and 395 are missing after the floods. The Voice of America gives similar statistics -138 people killed and 400 missing, nearly 20 million houses destroyed, with 24 thousand local residents left homeless and in need for food. The radio station “Free Asia” (famous for its hoaxes) reports a much higher toll of victims, with about 200 people killed or missing in the Tumen River area alone. This is supposedly due to the fact that the flooding occurred very quickly, and the water submerged the area of the city Hoeryong. The threat of famine has not been reported, as the rice fields Hamgyong Province account for only 2% of the total area of rice fields in the country. However, the amount of aid is estimated at between 15.5 and 28 million dollars, and part of it is already under way. For example, the World Food Programme decided to deliver to Pyongyang 77 tons of biscuits and 79 tons of soy beans as emergency aid. The actions undertaken by the DPRK government to eliminate the consequences of the disaster relief were timely and confident, a number of international organizations provided flood-affected areas of the DPRK with humanitarian supplies, and some of them plan to provide them with temporary shelter, medical supplies, and food. However, on September 20, 2016, the UN Resident Coordinator in the DPRK and the Permanent Representative of the United Nations Development Programme in the country Tapan Mishra urged the international community to provide humanitarian assistance to the DPRK. In an exclusive interview with Xinhua news agency, Mr. Mishra highlighted that in late October the temperature in the affected areas will drop to zero degrees Celsius. Winter brings further complications for the restoration works and 20 thousand houses need to be built before then. North Korea is able to build them, but it is experiencing a shortage of roofing, and for this reason “North Korea’s government expressed hope that the UN and other governments provide the necessary materials“. Nevertheless, our interest is more focused on the behaviour of the South and its allies here. And in fact, it is reacting exactly like twenty years ago during the famine of 1995-1997: they are now giving the exact same excuses and explanations as for why humanitarian aid should not be delivered to North Korea as they did then. According to the representative of the Ministry of Unification of the Republic of Korea Chung Hee-jung, “…the South is unlikely to help the North in the aftermath of the floods, even if Pyongyang formally requests it. Because the totalitarian regime decided to continue with its expensive nuclear weapons test after the flood had begun.” ». The leader of the parliamentary faction of the ruling Saenuri party Chung Jin-suk is of the same opinion. On September 20, he said that Pyongyang can only rely on humanitarian aid from the international community in the event of a complete halt of its missile and nuclear provocations. On the same day, the Ministry of Unification of the Republic of Korea declined the request from the Association of South Korean non-governmental organizations to provide the North with humanitarian assistance. And the Washington Post openly wrote that right now there should be no help granted, but rather sanctions should be tightened. “Let the regime cut its spending on defence and the state apparatus and then feed people”, which is an old, or rather very old approach. The only difference being that military spending in general has been fully replaced with the nuclear missile program, but the actual cost of restoration of the affected areas is much greater than the North Korean “Manhattan project”, and the means for the nuclear tests, including its infrastructure, training and security, had long been spent before the disaster. But the author is amused by another fact. In parallel with the refusal to help the North, on September 18, South Korea declared the Gyeongju area of Gyeongsangbuk-do Province a “special disaster zone”. On September 12, there was a strong (in Korean terms, and weak – in Japanese terms) earthquake – two shocks of a magnitude of 5.1 and 5.8 with more than 300 aftershocks of a magnitude of up to 3.0. The special disaster zone status provides that the restoration of the destroyed facilities and the provision of material assistance to the victims is conducted by the central government. In addition, the local residents of the particular region get permission for delayed payment of state duties, including property tax, purchase tax, and registration tax. Local residents can also rely on financial support in the form of low-interest loans for the restoration of the property, and the city of Gyeongju was given a grant of $ 4 million. In addition, 320 psychologists and doctors will be sent to the region. But what is the scale of the toll of victims and destruction in the South Korea’s case? The number of victims reached 48 people, almost 4,400 instances of damage to public and private property were registered, however there were no fatalities, the damage constituted mainly cracks in the foundations and walls of houses, damaged roofs, and water and sewer systems. According to preliminary estimates by experts, the total damage is estimated at 6,780,000 US dollars. And no, there is probably no connection with the fact that this area is part of the province of Gyeongsang – the residents there occupy a significant fraction among the Korean regionalists under the President Park Geun-hye. What is the moral of this story? Twenty years ago, Seoul representatives lobbying the refusal to provide humanitarian assistance to Pyongyang in any form openly justified it by the fact that in a difficult economic situation the population of Pyongyang would finally understand the criminal nature of the regime and will overthrow it. However, this did not happen, and North Korea learned a lesson. Thereafter, many elements of its strategy, including the nuclear missile program, began to be developed based on the assumption that its neighbours are principally hostile and unwilling to take any measures to ensure dialogue and consensus. This naturally strengthened the position of the “hawks” and partially led to what we see now, twenty years later. The author understands that it is now a new generation, but perhaps it’s better not to step into the same trap twice? Konstantin Asmolov, Ph.D. in History, Chief Research Fellow at the Center for Korean Studies of the Institute of Far Eastern Studies of the Russian Academy of Sciences, exclusively for the online magazine “New Eastern Outlook”.